Many of you have asked about how to use the cheat sheet in auction drafts. It is actually a perfectly suitable format for using the sheet, so we’ve created this simple set of auction instructions to go with the Auction Sheets now available in your downloads section. Remember, this set of instructions is different from the three easy steps on the cheat sheet – and only to be used if you are participating in an auction as opposed to a traditional snake format. 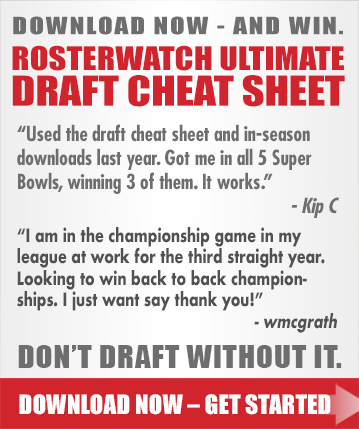 Rosterwatch PRO members can find all the “traditional” (snake draft) cheat sheets in their downloads section as well as separate sheets to be used in auctions. 1) Next to each player, in space provided, record the player’s auction price to the winning bidder. 2) With opening bid, nominate a player you are not interested in, preferably outside of the Top 10-15 range positionally as listed. 3) Take a non-aggressive approach to early bidding and allow a small market sample of winning bids to appear recorded on your cheat sheet. 4) Identify auction nominations where it appears players higher up on the sheet may be had for less budget than players below him went for. 5) Bid aggressively on players in these situations until the value no longer exists. Is there anything that needs to be done differently of Im drafting standard instead of snake format? I.E ill have the 1st pick in each round. Does roster watch give you a round by round sheet of where players should be taken? RW nation! I’ve done a handful of mocks so far, 15 rounders. Without bastardizing the sheet, I find myself having to deviate in the 12th and 13th rounds to select a QB and TE. otherwise they just never come up for me. I sorta feel ok with this due to QB being super deep. But I’m in leagues where people REACH and draft a lot of QBs (these leagues aren’t 2 QBs or suoerflex). Should I just follow the sheet exactly until my last 4 picks when I need a QB, TE, DEF, and K? Most likely when the rubber meets the road in your real draft, you will be just fine waiting. However, if you are only talking about “reaching in RD 12/13” that’s not considered going too far off the reservation, and we can live with it. We hate bastardizing but we expect you guys to be able to exercise some basic discretion on occasion. Thank you Paul so much for your support. Cheers to an incredible season! Do y’all recommend a site or have baseline values for a auction dynasty startup? Fantasy Pros auction calculator gives a good baseline. Adding these values in a separate column helps to identify value as the draft evolves. New member here to RW nation. I’m trying do a few mock draft using the cheat sheet on draft wizard app but I’m not having any luck. Do I need a membership with fantasy pros to sync the RW cheat sheet to draft wizard app? Yes you do need a membership with Fantasy Pros. You should be able to premium content which includes the Auction Simulator by making a $10 deposit to Draft through the Fantasy Pros link. Then you can also use some of the RW DFS content with some play money. Thank you rw-FUPA for the advice. I will try that. What players have you noticed are constantly being drafted on your team? So basically, what players do you have ranked higher then industry ADP’s? I’d like to at least have those players marked as I head in to some of my auction drafts, maybe do some extra research on them. Open to hearing back from other PRO members on their feedback if they have done multiple drafts already. Houston Oilers here again for another year of RosterWatch Nation. 16 team 1/2 PPR. We start 1 QB, 2 RB, 2 WR/TE, 1 Flex, D/ST and K. And only 3 bench spots. We DO NOT have to draft a Tight End but can draft 3 if we wish. My second pick, at this time is always Jerrick Mckinnon, and I could have the likes of TY Hilton, Adam Thielen, Tyreek Hill and Travis Kelce as they are generally available. But rather than bastardizing the cheat sheet, I have been sticking with McKinnon. It typically means that my WR1 and WR2 is JuJu and Hogan. Not too exciting but workable, especially since picks 5-8 are typically WR heavy. My question centers around the 8th pick in my draft (pre QB, D/ST and K) I am typically left with a decision between C.J. Anderson and Anthony Miller. Furthermore, I usually only have 3 RB’s on my roster at this time. I usually pick up a Rex Burkhead as my RB3. Do I select C.J. Anderson to balance my RB’s and Recievers 4/4 or do I select Anthony Miller and go 5/3 Receiver Heavy, because I am a member of the greatest nation known to mankind, ROSTERWATCH NATION!!!! Can you add the bye weeks on the PPR cheat sheet? Russell Wilson was the highest scorer last season. How long should i wait on QB? Aaron Rodgers will prob go in the 3rd rd. If i get the best RB WR combo that i can get, and land the #1 QB like Rodgers, Wilson, Watson Newton, then i would be loaded. Do you guys agree?? Is there any advice on Def or PK draft order? I know we should be picking these guys later, but is there anything to help rank these? Thanks! The Standard Sheet I downloaded tonight (6.2, what are the numbers in Parenthesis next to each player?